The largest of colored diamonds, the famous Hope, weighs 44.4 carats, and is of a deep sapphire-blue in color (coloring agent is boron). 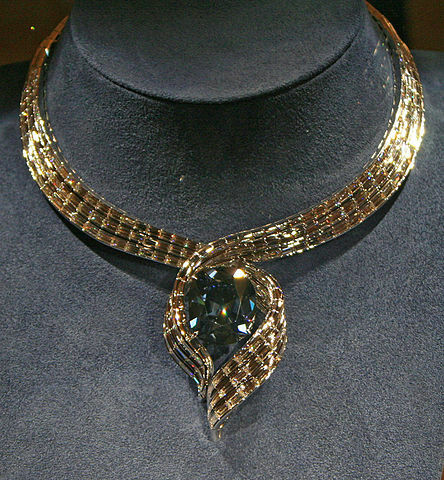 Hope diamond is also known as Le Bijou du Roi ("the King's Jewel"), Le bleu de France ("the Blue of France"), and the Tavernier Blue. It is believed to be the main portion of a drop-form stone (d’un beau violet), which was found at the Kollur mines, Golconda, (today, the Guntur district of Andhra Pradesh) India. The first historical records suggests that the colored diamond was purchased by French merchant-traveler named Jean-Baptiste Tavernier in 1642. Tavernier sold the diamond to King Louis XIV of France in 1668 with 14 other large diamonds and several smaller ones. In 1673 the stone was recut by Sieur Pitau, the court jeweler. In French royal inventories, its color was described as an intense steely-blue and the stone became known as the "Blue Diamond of the Crown," (French: diamant bleu de la Couronne de France) or the "French Blue." It was set in gold and suspended on a neck ribbon which the king wore on ceremonial occasions. The French Blue was among other precious stones which were stolen from the Garde Meuble (Royal Storehouse) on 17 August 1792. 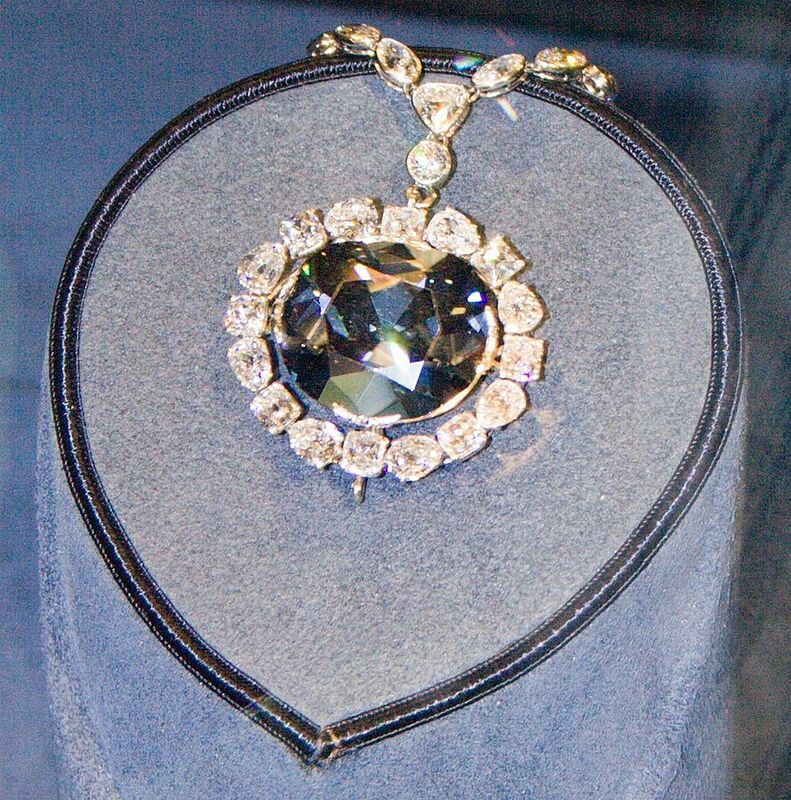 Unlike some other famous stones, Hope diamond never recovered. A likely scenario suggests that the stolen French blue was smuggled to London after its disappearance and recut into two pieces, and the larger one became the Hope Diamond (by that time the blue diamond was not known as Hope diamond). In 1830 the resent stone was affered for sale by Eliason, a London dealer, and was purchased for £18,000 by Henry Philip Hope, a wealthy banker from whom the diamond takes its current name. In 1901, famous Hope diamond was sold to a London dealer who quickly sold it to Joseph Frankels and Sons of New York City. In 1911 Hope diamond was sold to Mrs. Evalyn Walsh McLean. The diamond mounted as a headpiece on a three-tiered circlet of large white diamonds. Sometime later it became the pendant on a diamond necklace as we know it today. 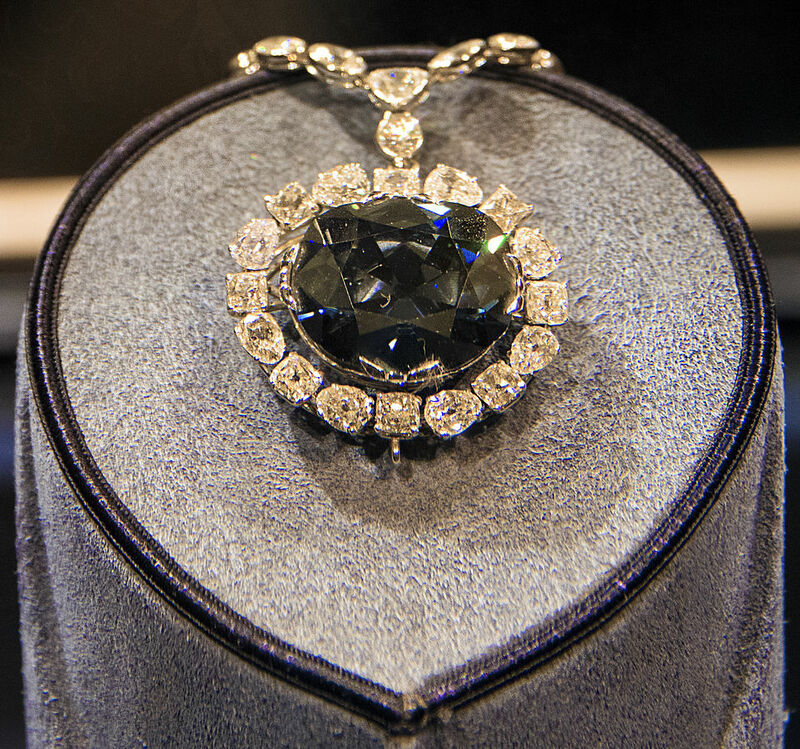 On November 10, 1958, the Hope diamond was donated to the Smithsonian Institution, and almost immediately the great blue stone became its premier attraction. The famous blue Hope diamond still is owned by Smithsonian Institution and its current value is $200–$250 million USD. "Hope Diamond Closeup" by Mbalotia - Own work. Licensed under CC BY-SA 3.0 via Commons. "Hope Diamond" by David Bjorgen - Own work. Licensed under CC BY-SA 3.0 via Commons. "Hopediamondnewset" by Originally uploaded by Observer31 (Transferred by Oyoyoy) - Originally uploaded on en.wikipedia. Licensed under CC BY 3.0 via Commons.